The junior version of Canon PhotoMarathon held in KizCiti with a wide range of activities for little photographers. Aimed at awakening the photographic potential of the children of Vietnam, the Canon PhotoMarathon Junior today marked the return of the company’s flagship event’s kids category after a two year absence. 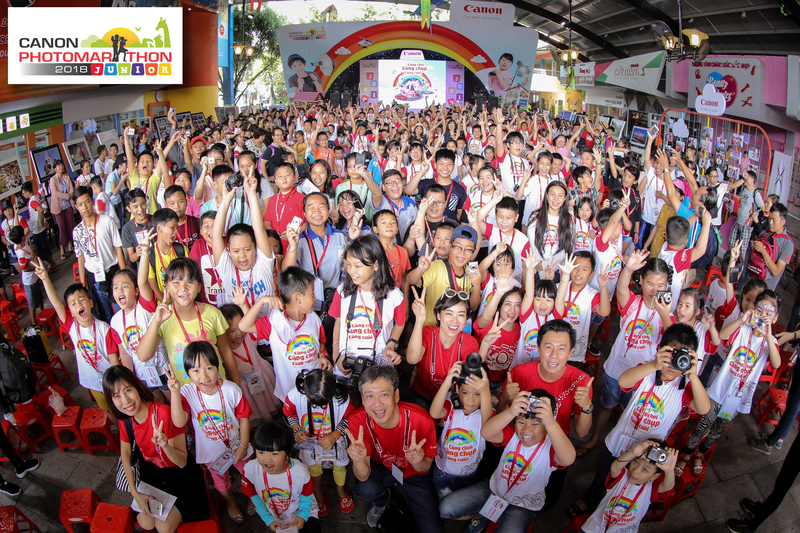 Held in a two-hectare area inside KizCiti in Ho Chi Minh City’s District 4, Canon PhotoMarathon Junior is not only a creative photographic race but also a playground for children. Both parents and children took the chance to "wield the wand" capturing stunning and unique patterns and shapes in the light-painting dark room. 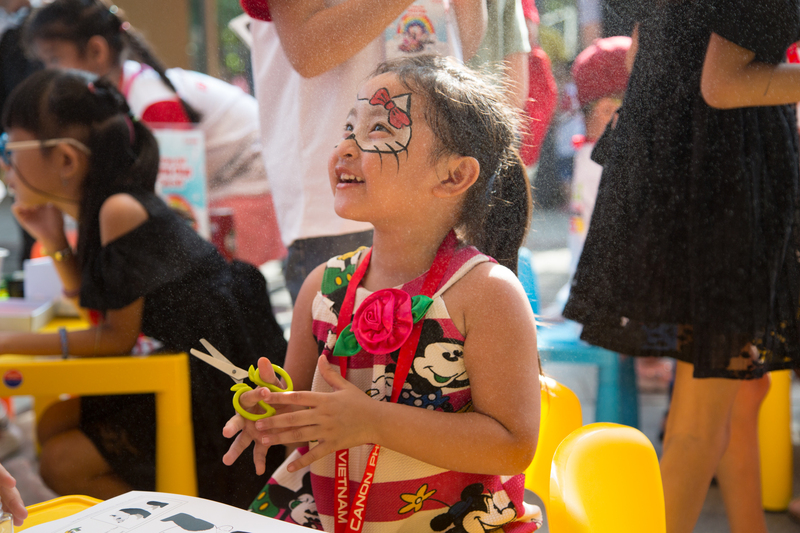 Kids also took the chance to disguise themselves as their favorite cartoon characters at the special Face Painting booth. Also, at the Zoom and High Speed booths, kids were shown basic photography skills by Canon experts. Furthermore, the event gave guests opportunities to experience and purchase Canon products at very attractive prices. Following the performance of dance crew ABC KIDS, a short clip was shown and the first topic – Colors of Life was announced. With the second topic, Sharing, revealed after the submission time of the first. Both challenged the little contestants creative impulses, but they certainly managed to surprise judges and parents with their unique perspectives. With palpable excitement surrounding the complex, inspiration stuck the miniature brigade of photographers, who ran all over the area to get their assignments finished on time and submitted to the judges. Two hours and 550 submissions from 800 contestants later, the judges took on the arduous and challenging task of awarding the best photos to win the mirrorless EOS M100 camera. Judge 1 – Mr. Hiroshi Yokota excitedly shares his thought of Ta Thuy Lam’s photo: “We were all really surprised by the quality of entries we received today. Thuy Lam's work captured a very beautiful moment. It is an image loaded with ingenuity and composed with harmonious colors. It reflects the strange and innocent angle of view that adults have often outgrown." Along with that, judge 2 – Mrs. Le Thanh Hang, Assistant Director of Image Communication Products & Corporate Communications, is impressed by the photo of Ho Tri Thien which is the winner of the second topic – Sharing. Nguyen Quynh Lam’s photo, which won the “Cute” prize. Judge 3 – Mr. Tran Bao Hoang, Expert of Image Products, comments: "The work of Quynh Lam is very ‘cute’ depicting a lion with a colorful curly wig in the middle of the picture. It made all of the judges laugh. The subject in the photo is a close-knit toy that showsa kind of rustic innocence." Officially closed at 2 p.m., Canon PhotoMarathon Junior 2018 not only fulfilled its mission of providing a fresh, meaningful playground that inspires those children the passion of photography, but also left a good impression on both participants and their parents. Mrs. Ngoc Minh (District 2, HCMC.) shares: "In my opinion, Canon PhotoMarathon Junior is one of a few summer events that bring both quality and meaningful things for children. In one day, they not only learn a lot of good things about photography but also have the opportunity to compete, have fun and make new friends. I hope Canon will continue to organize more useful and fresh programs for children in the future."